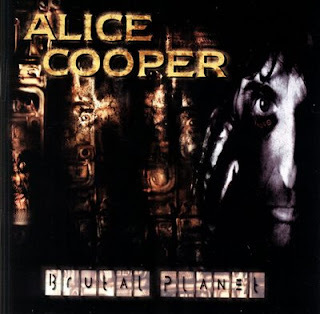 Hall of the Mountain King: Still Spinning: Alice Cooper, "Brutal Planet"
As I await next month’s release of Alice Cooper’s latest record Welcome 2 My Nightmare — with much more anticipation, I might add, now that I’ve heard some samples — I decided to revisit my favorite of his more modern efforts. You see, Alice kind of got off-track in the 1980s. That’s not to say that he didn’t release some good stuff then, but he did kind of get pulled along with the flow, which runs counter to what he’s always been about. He released a few records with a parade of guest musicians that were some of the hottest commodities on the hard rock scene at the time, and the albums didn’t have quite the bite or impact that his earlier work had. He started to change that with 1994’s The Last Temptation, a darker concept record based around a protagonist named Steven (a clear tip of the hat to his classic Welcome to My Nightmare) and an antagonist known as The Showman, who in the comic by Neil Gaiman was portrayed as Cooper himself. It still had its share of guest stars — Chris Cornell, Tommy Shaw, Jack Blades — but there was a different demeanor than, say, Trash or Hey Stoopid, two of his most successful commercial releases. After the release of The Last Temptation, which wasn’t as well received commercially as his previous two records, Cooper parted ways with Epic Records, and it was six years before he released another studio album. But what a record we got out of the long layoff: Brutal Planet, issued in 2000 on the smaller Spitfire label, was a gut-punch. It was dark, heavy, gnarly, mean and nasty — easily the most metallic record of Cooper’s career and the antithesis of those late 1980s records that made him a regular sight on MTV. Alice announced his intent right out of the gate with the title track, a chunky, militaristic metal march that has much more in common with Metallica than most of what he’d previously done. Lyrically, he paints a bleak picture of life on earth, running through the biblical story of Adam and Eve and a litany of ills that mankind has visited on the planet. For all the heaviness and bleakness, though, Alice still manages to make the tune damned catchy, with some solid hooks and an interesting angelic chorus interlude that seems to revisit the origins of the planet, before all was corrupted. Not only was the music heavier, but so were the themes. Among them were hate crimes (“Blow Me a Kiss”), genocide (“Pick up the Bones”), school shootings (“Wicked Young Man”), hunger and gluttony (“Eat Some More”) and a recurring theme for him, domestic violence (“Take It like a Woman,” which not surprisingly will remind listeners of “Only Women Bleed”). As with Alice’s best work, the lyrics here are, at times, uncomfortable, and he did catch some grief in a post-Columbine world about a line from “Wicked Young Man,” where he sings “I’ve got a pocket full of bullets and a blueprint of the school/ I’m the devil’s little soldier, I’m the devil’s little tool.” The song argued that you can blame a lot of different things (music, movies, games) when something like Columbine happens, but the truth is that that some people are just evil. Perhaps it’s not a popular notion, but it’s as good an explanation as any. Most of Brutal Planet could be viewed as a kind of morality play set to metal. There’s a clear struggle between good and evil in just about every song, and there’s a clear message from Cooper on most of them. In his real-world personality as Vincent Furnier, Cooper is a born-again Christian, and there are certainly plenty of biblical references and viewpoints expressed here. Not that anyone would ever consider Brutal Planet to be anything approaching a Christian record, but I’m betting a lot of people who wouldn’t dream of listening to Alice Cooper would probably agree with many of the points he makes. Like any good morality play, there’s also a meeting with the devil. I’m generally iffy on those in metal, but I give some artists a pass, and Alice Cooper is definitely one of them. In fact, Brutal Planet’s tale of Satanic temptation, “Gimme,” is probably the best song on the record. It opens with an electronic beat, then more heavy guitar riffing. Alice comes in, his portrayal of the devil a perfect blend of sinister and sophisticated as he tempts the listener with promises of fame, money and power. The delivery and the lilting melody of the song prove irresistible. Brutal Planet is not all doom, gloom and seriousness, though. Alice’s trademark black sense of humor comes into play on a couple of tracks, most notably “It’s the Little Things,” a driving hard rocker in which he goes through a long list of things of varying levels of unpleasantness that you can do to him. Among the little things of the song that drive him wild, though, “if you talk in the movies, I’ll kill you right there” or, poking a little fun at himself, “if I ever hear you ask me how I got my name.” Also a little more upbeat is the Rob Zombie-flavored “Sanctuary,” which has always been one of my favorite songs from the album just because I really relate, particularly during the all-too-frequent times when the daily grind interferes with my happiness and well-being. Finally, you have to talk about the closing track of the record — “Cold Machines.” It’s not the best song on the album, sounding perhaps a little too much like Marilyn Manson’s “The Beautiful People,” which is weird for me, since, obviously Manson stole more than a few pages from Cooper’s playbook. On the other hand, the song, which portrays people as unthinking, unfeeling robots passing each other on the street every day without acknowledgement, does nicely tie up the themes of the record. It illustrates the effects of all of the ills that he’s expounded upon earlier, turning us into cold, uncaring shells. After Brutal Planet, Alice did one more record in this heavier mode, 2002’s Dragontown, which was quite similar, but not quite as effective. After that, he returned more to his garage-rock roots for his next few records until finally ending up back in his creepy native habitat with the serial killer concept record Along Came a Spider, his best effort since Brutal Planet, in 2008. A sequel to that one was planned, but shelved when he decided to record a follow-up to arguably his best work titled Welcome 2 My Nightmare. Brutal Planet likely won’t top many people’s list of the best Alice Cooper records or be mentioned alongside classic albums like Welcome to My Nightmare and Billion Dollar Babies, but in my opinion, it belongs there. I love the heaviness, grit and, well, brutality, of much of the record, but I’m equally intrigued by the messages, themes and morality play approach. For all of the shocking things that Alice has done over more than 40 years, Brutal Planet is, very likely, his darkest and most disturbing moment simply because most of the subjects he attacks aren’t made-up horror movie boogey men, but very real and very serious issues that, more than a decade later, still plague our society.